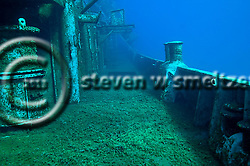 View the complete USS Kittiwake shipwreck photo gallery here or click on each photo to go to the gallery. 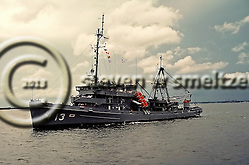 The USS Kittiwake shipwreck is a Chanticleer Class Submarine Rescue Ship. Its keel was laid down, January 5, 1945, at the Savannah Machinery and Foundry, Company shipyard in Savannah, GA. It was launched on July 10, 1945 and commissioned as the USS Kittiwake (ASR-013). 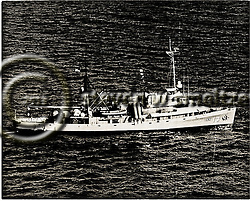 She was decommissioned September 30, 1994 and struck from the Naval Register September 30, 199 4. 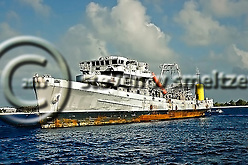 She was initially transferred to MARAD for lay up in the National Defense Reserve Fleet and then withdrawn from the fleet February 18, 2010 and prepared for reefing in the Cayman Islands. The Chanticleer Class ships were designated specifically for submarine rescue. Each ship in this class was equipped with powerful pumps, heavy air compressors, and special mooring equipment. 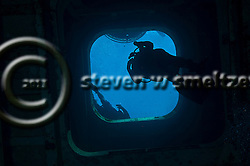 The Chanticleer Class ASRs support air and helium-oxygen diving operations to a depth of 300 feet of sea water (fsw) and use the McCann Rescue Chamber for submarine personnel rescue operations. The ASR design provided a large deck working area. The USS Kittiwake shipwreck finished a distinguished service career spanning almost 50 years when she was decommissioned from the U.S. Navy in 1994. Following her retirement, the ship became part of America’s National Defense Reserve Fleet under the control of MARAD, or the Maritime Administration, part of the U.S. Department of Transportation. 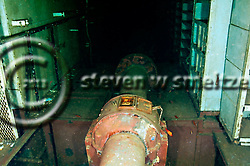 The ship ended her career as the first MARAD ship sold to a foreign government for artificial reefing. Islands government and the Cayman Islands Tourism Association (CITA). 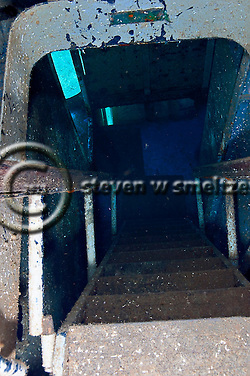 Negotiations had to be conducted and funds raised to purchase the ship from the U.S. government and prepare it for sinking as a dive site, including removing hazardous contaminants and cutting openings in the hull and bulkheads to give divers greater access to the vessel’s interior. After years of delays and concerns that the plan might never come to fruition, the Kittiwake began the first stage of its last voyage in February, when it was towed from its Reserve Fleet mooring at Newport News, Virginia, to the facilities of private contractor Dominion Marine. There, all the final preparations for the sinking were completed. 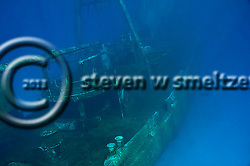 The ship was sunk January 5, 2011 off the north end of Seven Mile Beach in Grand Cayman. 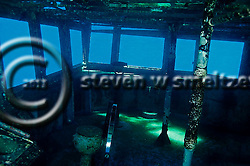 There are 5 decks on the 47 foot tall USS Kittiwake shipwreck. Externally, the crow’s nest, mast and large stern a-frame have been cut down and remounted to make her height suitable for Cayman waters. The upper decks accommodate the 2 bridges (both an external and internal bridge to allow operations in heavy seas) along with the radio and navigation room. The sonar has been removed. The Captain and XO’s quarters are also on the upper decks. On the main deck of the USS Kittiwake shipwreck, starting at the bow, you will find the rec room, mess hall, ironing room, small tool workshop and recompression chambers. You will also see a large a-frame structure on the stern that supported submarines and hard hat divers. This also supported the diving bell where divers would enter to return to the ship from the ocean and then be placed in the chambers for decompression. Below the main deck, 2 decks exist that include the crews quarter, medic/hospital station, engine and propulsion rooms, air bank storage and compressors, as well as the steering gear, shaft, gyro, ammunition lockers, cold storage and barber shop to name a few areas. 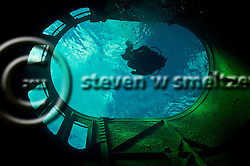 While the USS Kittiwake shipwreck has been opened up with large access holes both vertically and horizontally, every space on the ship was used while in service. Largest Boom Capacity 11 t.
two Diesel-drive 200Kw 120V/240V D.C.